These were just something I threw together for a 4th of July party, aren't they cute and pretty? I'm not gonna lie, I'm not one for fancy food that takes a lot of time to assemble. But these were worth the extra bit of effort. Feel free to mix up the fruit choices, but I encourage you to keep the feta! 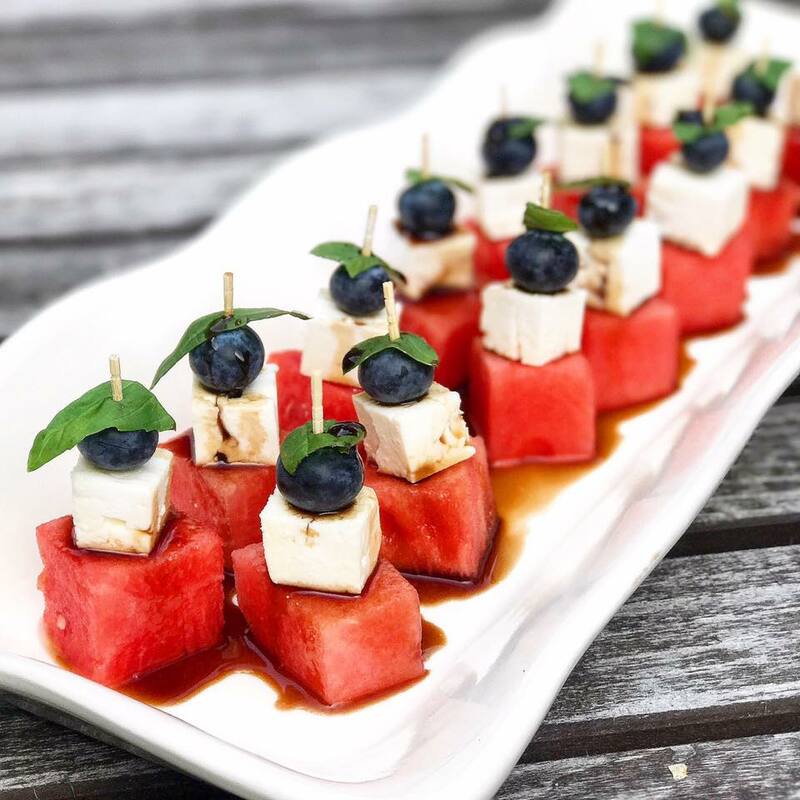 The combo of the feta and basil with the balsamic glaze is OH SO GOOD with the sweetness of the fruit. And I can guarantee you people will be impressed if you bring this colorful dish to any gathering. Cut the watermelon and feta cheese into cubes. I prefer the watermelon cubes to be a bit larger than the feta, I think it looks prettier when stacked. Assemble the skewers: basil leaf, blueberry, feta cheese, then watermelon. This is why you need the longer toothpicks! Pierce the pieces gently so they don't fall apart -- especially the cheese! Place the balsamic vinegar and honey in a small saucepan. Bring to a boil, then reduce to a simmer for about 10-15 minutes. Liquid should reduce by about half. Let sit for about 10 minutes so it will cool and thicken. Drizzle on top of skewers or place in a small bowl for people to drizzle themselves.